As I mentioned in my most recent beauty haul post, my skin has had a serious case of Winter-face. With the heating being on nearly all day, every day and the weather outside being very nippy, my face is rebelling and leaving me with dry skin that could give the Sahara desert a run for its money. Whilst in my local Bobbi Brown store, I got chatting to one of the team, and they recommended the Bobbi Brown Skin Nourish Mask. All about intense moisturisation for smoother, plumper skin, this light lotion come gel injects the skin with a non-greasy shot of moisture that lasts for hours. Containing: Coral Grass, Hydro Herb and Salicornia, to lock in and regulate moisture, as well as plumping, smoothing and nourishing the complexion. If that isn't enough, Chlorella Extract and Muru Muru Butter help boost collagen production, strengthen the skin’s moisture barrier and reduce the appearance of fine lines. Hands up, I can be fairly lazy when it comes to skincare. Don't get me wrong, I give myself an at-home facial once a week, but sometimes I tend to skip the cleanse and moisturise routine. This mask is perfect if you're like me as you don't have to wash it off. So you can sit and watch your favourite TV programme or in my case, catch up with a bit of blog writing whilst wearing the mask. 5 minutes later, tissue it off and massage the excess in. A couple of side notes: 1) It comes in travel size tubes as well as the full size one above, so it would be a great to pop in your travel bag for hot but drying climates and of course a long haul flight - I know it will be coming with me on my flight to NYC this week. 2) If used three times per week, it helps repair skin’s natural moisture barrier and reduces the look of fine, dry lines. 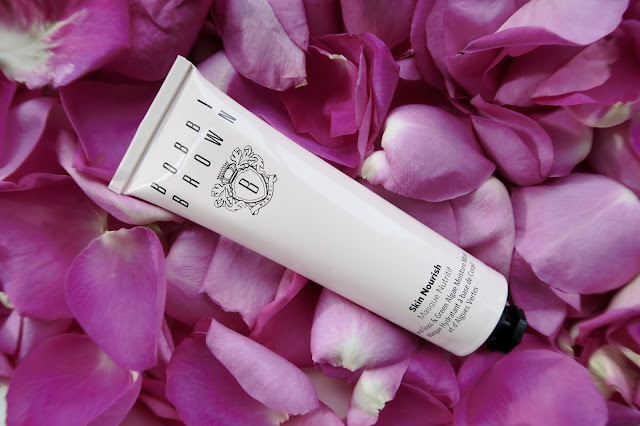 Available to purchase at Bobbi Brown counters, online and stores now.